1. Scientists want to share their science (whether or not they know how): After attending sessions all week and presenting on Monday, I have encountered a lot of scientists who want to share their research, whether it be through public outreach, journalistic stories or blogging their own ideas. From my poster, I encouraged scientists to use what’s going on in popular culture as a springboard for spreading ideas. The holiday season is coming up, so how can you relate your science to that? What will be going on in space that day? How can you cut down on fossil fuel emissions during holiday travel? What will the weather be like? This method can be applied to any event. Think of what the public is thinking about – then relate to it. Takeaway from this lesson: I am amazed at what planetary scientists can do. And I still do not get it. 3. The AGU is even more awesome: Networking, networking and more networking. I was able to meet my science writing idol, Liz Neeley, and even take a selfie with her. Meeting Kara Rodean and Ali Branscombe of AGU face-to-face helped me realize what cool jobs they have and how much work they put into the fall meeting! Presenting in the Outstanding Student Paper Award makes me proud of all the student scientists at AGU. Helping Kimmie Bowen (Dr. G‘s student) get through the meeting reminded me how far I have come as a presenter and student. Tweeting with the student volunteers all week gave me a new appreciation for Twitter (mostly that I’m obsessed with it, still). Meeting up with Dr. G (for the first time since AGU last year!) has engrained in me the important impact she has had on my life from the first time I took her class in 2010 at Penn State Brandywine. Lastly, I’m thankful for the people at AGU who help convene sessions, especially the keynote talks! Secretary of the Interior Sally Jewell is by far the most inspiring cabinet member I have ever encountered (okay, she’s the only one), and I’m happy AGU was able to make that happen. Stay tuned for my AGU blog post on that one later! Overall, I am thankful to have made so many amazing connections at AGU, both new and old. I’m thankful that I’ve been able to come to AGU for the last three years in a row, and that San Francisco is the greatest city on the west coast! Until next time, AGU! Sometimes the days feel like weeks at the AGU Fall Meeting, but we have all made it through hump day! This morning, Kimmie Bowen (Dr. G‘s student) and I wandered around the Education section of the poster hall and talked to a whole row of undergrad researchers/scientists doing some pretty amazing things under their research advisors and grants from organizations like NASA! After the poster presentation, I networked with a couple AGU staffers – Ali Branscombe and Kara (Smedley) Rodean, who are in charge of student programs at AGU. I have been e-mailing with them for a few months prior to the meeting, and Kara since last year, so I was happy to spend some time with them outside the screen! Kimmie and I went around the Exhibit Hall again, and stopped by the AGU Marketplace to see Dr. G (Laura Guertin) at her “Ask the Expert” couch-side chat where she helped explain social media to the scientists who stopped by! She said most of them needed help with Twitter. She knows that NOAA is doing a good job, but wants to do better. Throughout the talk, she continually referenced building resilient communities through more reports from NOAA. Sullivan ended her lecture with hope that scientists can work together to figure everything out, with more access to information and better weather/climate monitoring. My last event was the Social Media Forum hosted by AGU and the National Association of Science Writers. The panel was full of superstar social media gurus: Andrew Freedman, senior climate reporter for Mashable, Sarah Horst, earth and planetary scientist at Johns Hopkins, Laura Helmuth, science editor at Slate, Scott Horvath, web and social media chief for USGS, and Allen Pope of the National Snow and Ice Data Center. The supergroup answered questions from the audience and had general conversations about best practices for social media. Here are some tweets from the event. 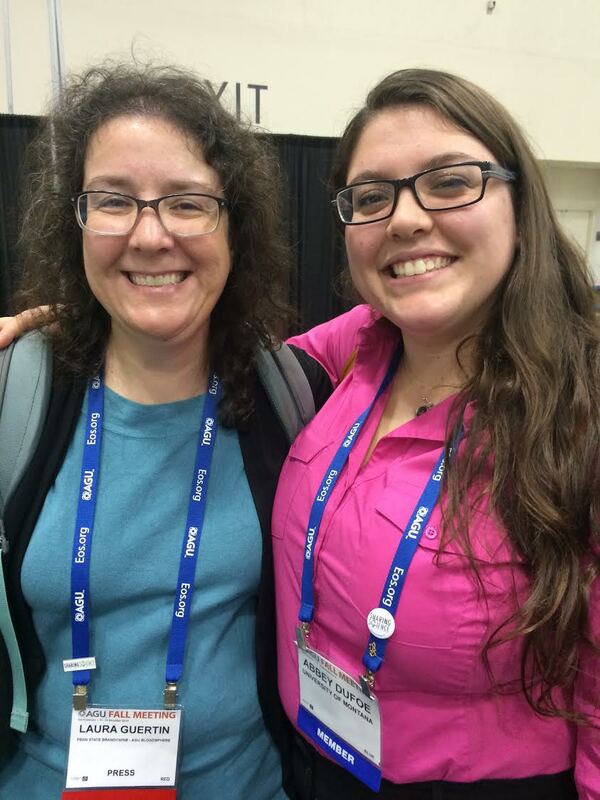 Nicky Ouellet is another grad student in my program who is attending AGU as press! I also finally got to meet some of my fellow student volunteer live-tweeters! I’ll leave you with my most popular tweet of the day. Follow me on Twitter for more!